A difficult situation or problem that people don't agree on and don't want to handle. In the USA, gun control remains a hot potato in politics—even after mass shootings at schools. Another hot potato in US politics is whether or not to keep abortion legal. Raising salaries for non-managerial staff has become a hot potato at my office. Mediterranean migrants are Europe's hot potato. President Trump's trade wars are becoming a hot potato for farmers in several states who are negatively affected by tariff wars with foreign trading partners. Immigration is a real hot potato in the United States today since the President declared it a national emergency. In many places in the world, health care is considered a fundamental right but it's another hot potato in American politics. 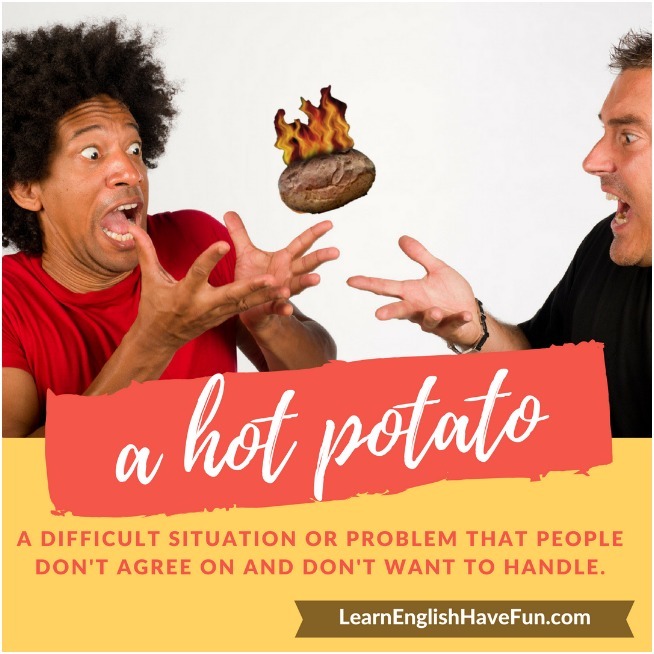 Your turn to use the idiom "a hot potato"